Today I had lunch with a good friend, Maria. 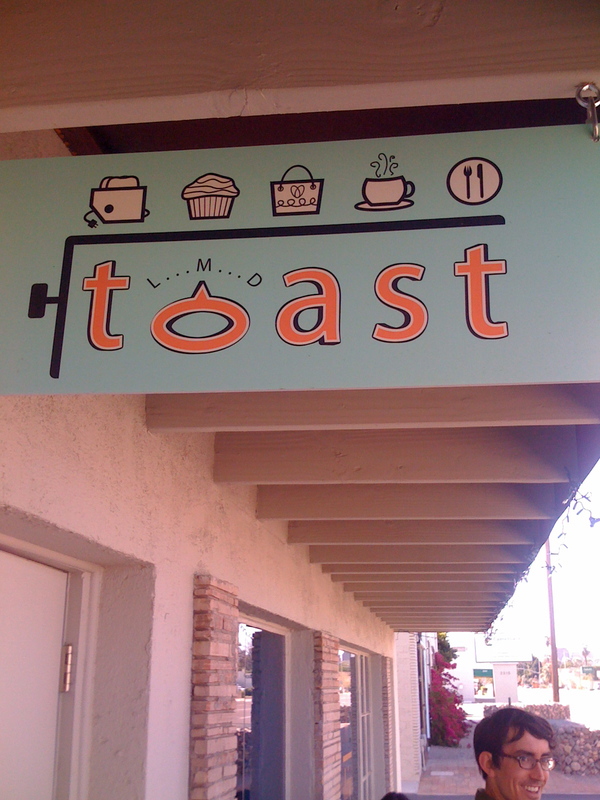 We ate at T oast. Don’t try to find it. The locals are keeping it their little secret. Anyway, Maria and I originally met at a SARK workshop. SARK herself teamed us up together, and that’s how two strangers became friends. But friends who came together to push one another to fulfill our lives through creativity. Some of you have heard of Maria. I always say she got me to actually set a date to perform EverReady Woman. Well, it’s true. Then she turned me onto Script Frenzy one year ago. 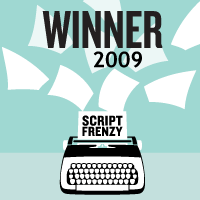 ScriptFrenzy is this cool project in which you join hundreds of other screenwriters/playwrights around the world, all trying to complete their script in 30 days. I did this too with her encouragement. While I have not had the same affect on her, she really inspires me. Maybe one day, all my jabbering on about her photography and writing will get her inspired to do her own unique thing. 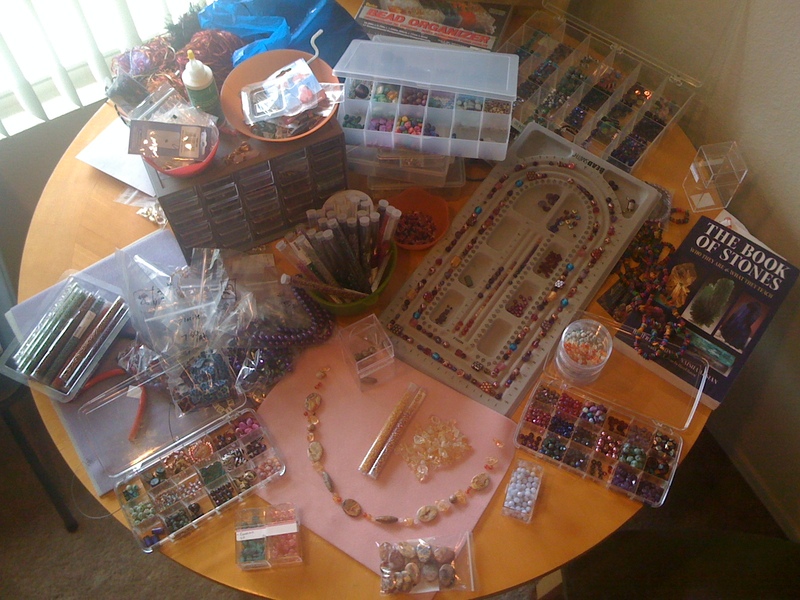 And to proove it, I have transformed our dining room into a beading room. No other crafts. No writing, no painting, both of which I like to do too. Nope. Just beading. I cannot even believe all the supplies I have. 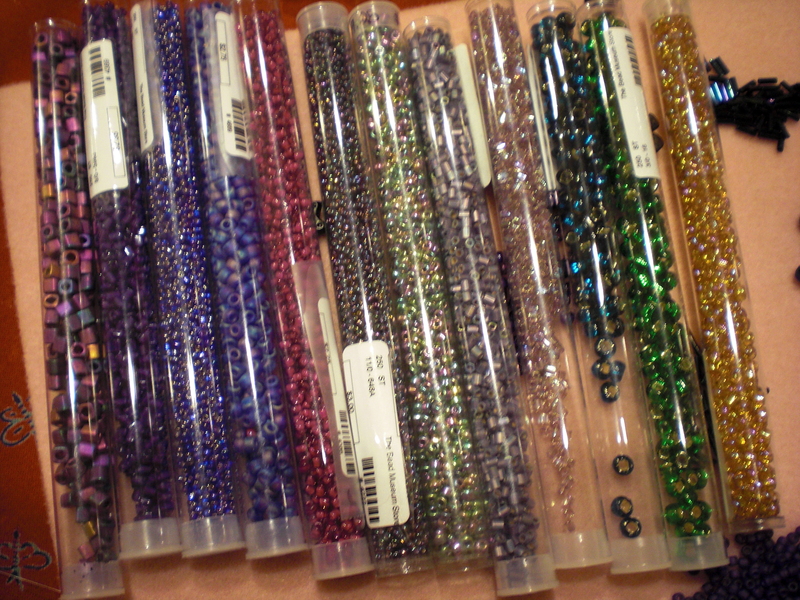 Not to mention the gazillions of beads. Tonight I came straight home from the dog park, before I had dinner, and sat for hours contemplating a brand new necklace and matching bracelet made out of giant discs of agate/jasper the colors of rusted paintcans. Blue, Burgundy, pink, gold, black, grey, gold and bits of crystal raspberry inside the little picture windows of the stone. They are magical stones. Beauty you cannot believe grows from the earth itself. The most beautiful stones with complete stories inside each one. 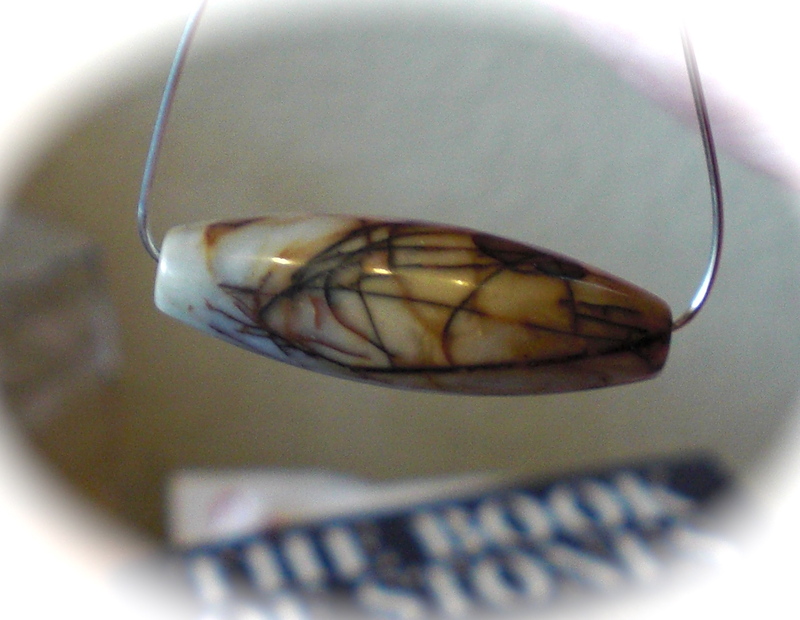 When I buy a bead it’s because it is unique – something fabulous. But I have no idea at the time what I will make with it. In this case, I NEVER buy earthy tones. It’s just not my thing. I’m a vivid neon girl. But these beads had pictures on them. Stories from the earth itself. Each color and line depicting a time in history as the crystal was formed. And then I found it! 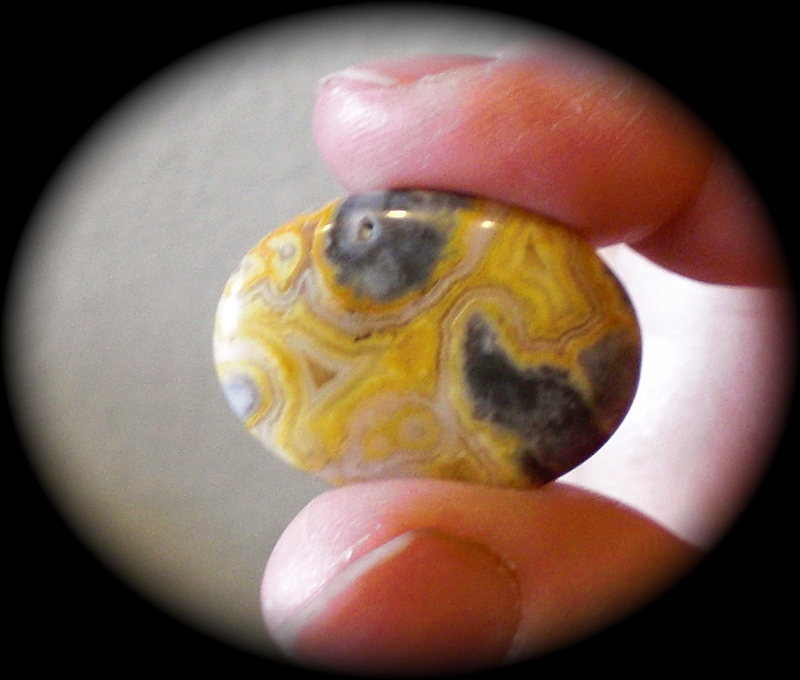 THIS BEAD WITH A WINDOW INTO THE VERY SOUL OF THE STONE! 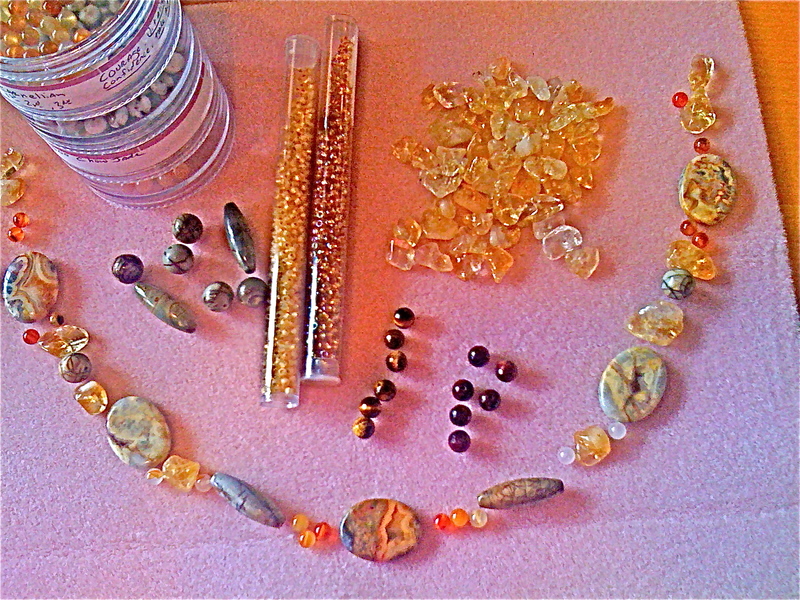 I was perfectly enchanted and looked at every single stone in the strand of 22 beads. Working at the Bead Museum has its distinct advantages for a beader. 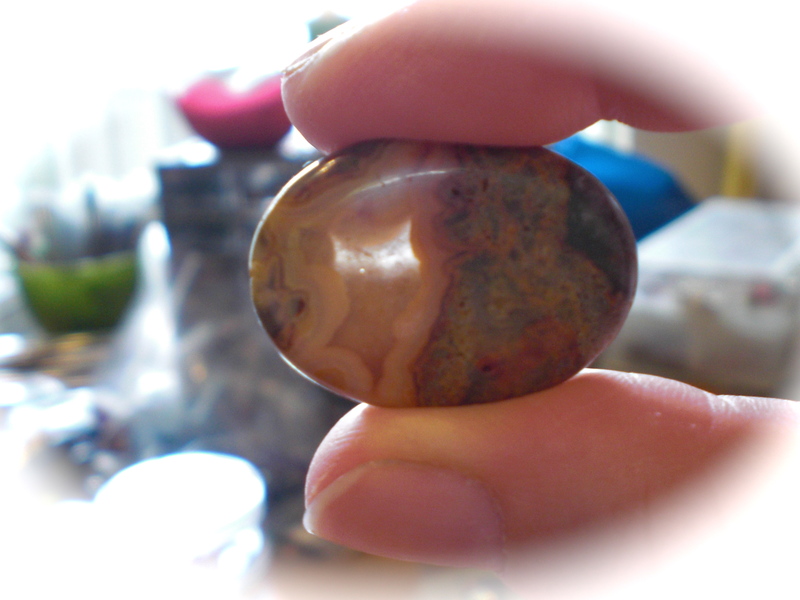 My co-worker Mary offered to take apart two strands of these agate/jasper beads and let me pick out the ones I wanted. I was thrilled. Our artist-in-resident Christy, a famous bead artist in this country, told me to be sure to pick out colors I was NOT drawn to also, like the gold ones, as they had the biggest interest for her when she created. Just BECAUSE you ignore them. I looked at them again. Oh yes, I see it. Those ugly colored gold ones had quite an appeal really – if I looked at them more closely. Then Mary said – “Look at these! They have druzy growing in them! And pink-burgundy druzy to boot!” So I looked closer . There it was. That crystally, glittery part of a gemstone called druzy (droozy) that grows on stones like fur and in every color of the rainbow. 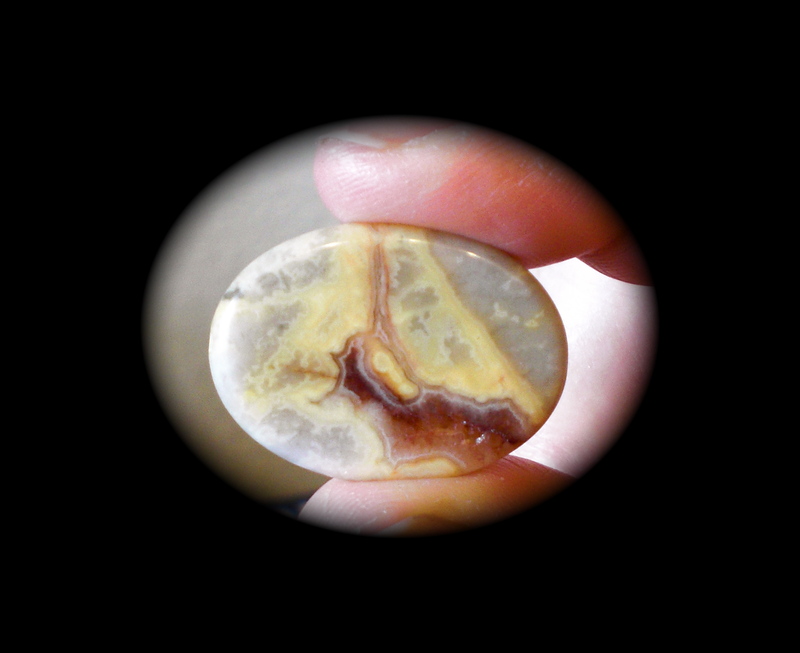 Sometimes the druzy is cut off a piece of agate like this and used for a gemstone ring. Imagine all that fabulous agate tossed out. It’s so gorgeous the way the earth created it – together! It’s one story this way. One complete story of history. 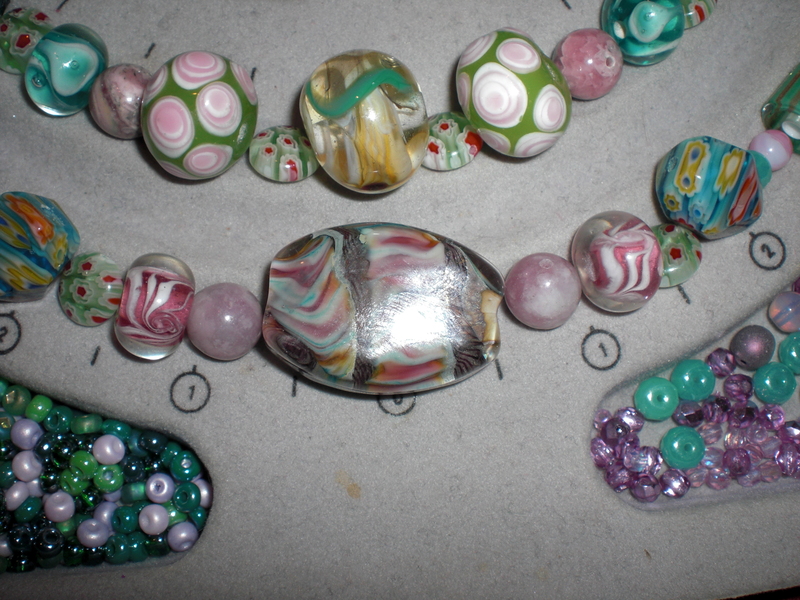 Now you might think my love of beads began with my job a year ago at The Bead Museum. But anyone new in my life would be wrong. All my old time friends know I have been making them jewelry for decades. 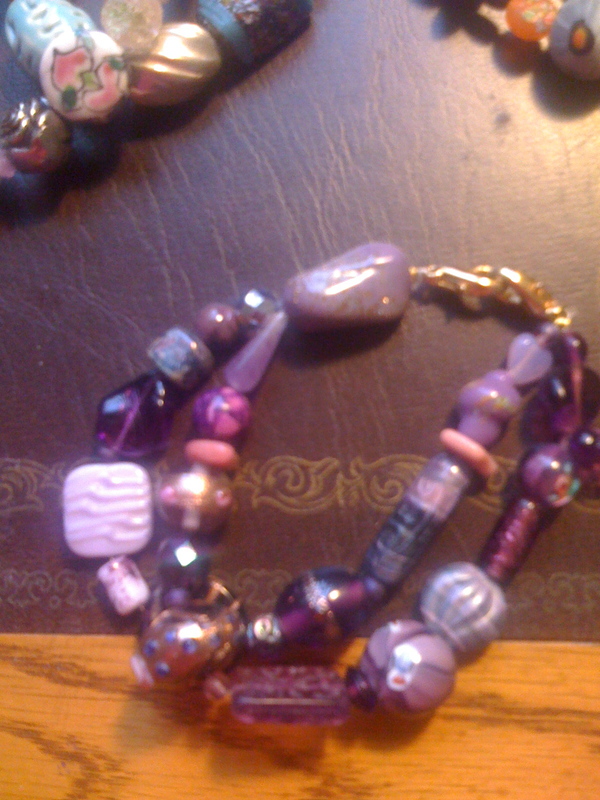 I first made double stranded bracelets with my 3rd husband over two decades ago. In fact, this bracelet was actually a copy of one I fell in love with in Jerome, AZ on my very first trip ever to Sedona. More serendipity, as I would eventually live and work in the Sedona area one day! So he and I began spending our pennies in Los Angeles buying beads and teaching ourselves how to make a bracelet. At one time, I made dozens and dozens of large size beaded bracelets because it is so hard to find a large bracelet for a large beautiful woman. I never got around to trying to sell them however and still have them all in a box. 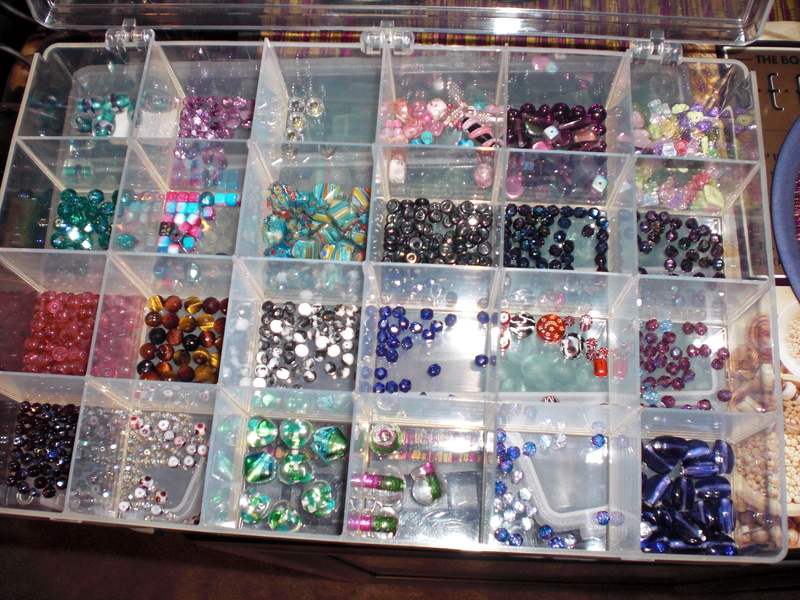 When he and I divorced, I got the beads and boxed them up never to deal with them again. Then one day, I had time on my hands and creativity running in my veins, and I got them out to make something for myself. They have never been put back again. When Stephen and I married, I introduced him to beading and he fell for the creative energy of the process quickly. And he makes completely different things than I do. He is teaching himself to wirewrap gemstones and makes these phenonmenal multi-strand multi-textured necklaces like you saw on Maria’s photo at the beginning. He’s fantastic to watch when he creates. Talk about serendipitous though. I work at the only comprehensive BEAD MUSEUM in the WORLD! Right here in little old Glendale, Arizona. I only have to work 4 days a week and so I have more time for my creativity than ever before. 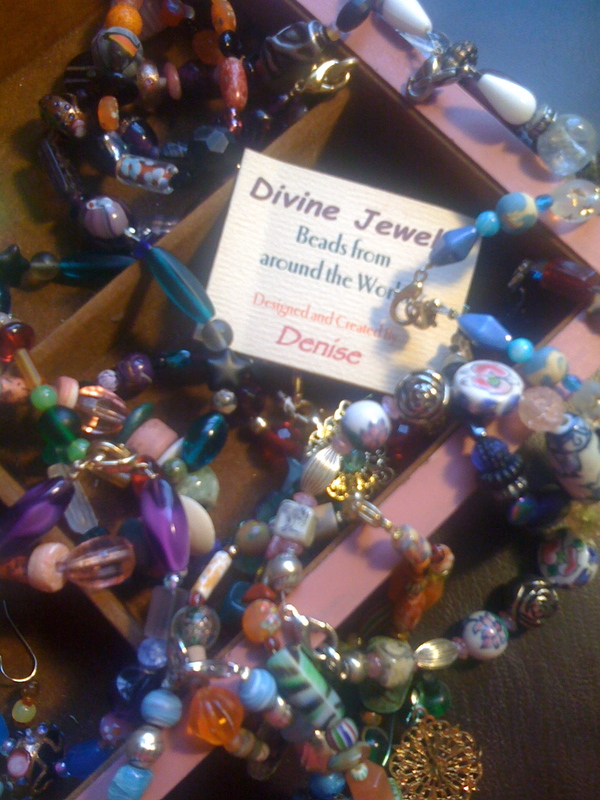 Not to mention the UNBELIEAVABLE access to beads, bead classes, gemstone and bead history and understanding. Couple that with amazing people coming and going every single day with their particular unique designs of jewelry around their neck, all with a giant history and story to tell you. Is that all meant to be in my life – or WHAT??? 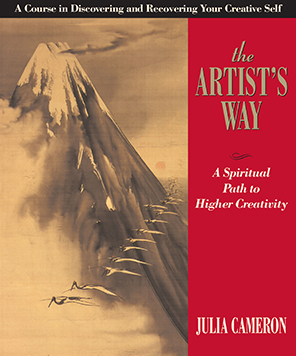 Just like Julia Cameron wrote in Artist Way – look for that serendipy happening in your life. It’s there. Directing you. So, it was only natural I begin writing about it too. But at this very moment, I have a itch to go make something. Enough talk/write/blogging! 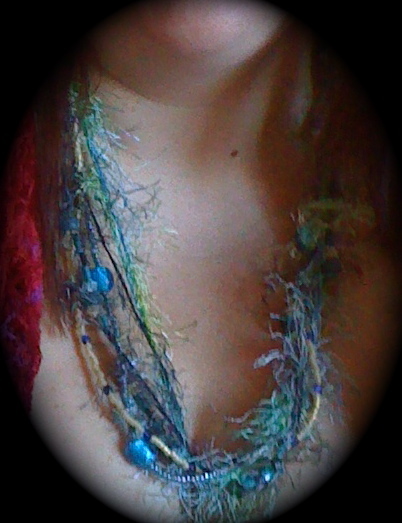 I HAVE to go finish this necklace. It’s dragging my mind back to the creative table like a huge hook around my soul. Now that is LIVING! That is finding a purpose and happiness in life. So Maria! I need to change my answer to you this morning. “YES! I have found something to stimulate me besides my writing. And I think it can work WITH my writing on my blog about creative endeavors.